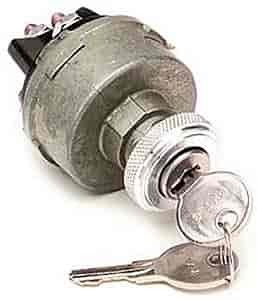 Dash mounted ignition switch includes two keys. No Instruction Manual available. 80153 is rated 5.0 out of 5 by 2. Rated 5 out of 5 by Kingfishford from Good Quality, Fit great in my 1950 Ford F1 Pick up Package arrived in a couple of days. also ordered the Painless Headlight switch w/ dimmer. Instructions are on the Painless web site for all their products. I did have to go online to get them. I also used a Painless wiring harness non GM column 12 circuit. This switch is perfect for my restoration. All the Painless products are working out great. Very Satisfied. How many terminals on back? There will be one in the center and 3 around the edge. The specs say 25 amps. Is that for both start position and run position? Or a total for both? So 12.5 amps each or 25 amps each? That is the amperage for any 1 contact. Can the keys be duplicated in case you loose one? Painless has no spares, one may be duplicated @ any locksmith or hardware store that can cut a key.